A few weeks ago, Alan Jones’ long workday started early with a meeting with the packinghouse manager and a supply salesman in his office at Jones Potato Farms in Parrish. Then the 51-year-old farmer and business owner was off in his white GMC 4×4 Sierra pickup truck to check on the potato fields and equipment behind his office and packinghouse at 1400 Dickey Road. Fifteen minutes later he was traveling down Buckeye Road to the green bean packinghouse to talk to his wife Leslie, the food safety coordinator of the farming operation, and field manager Ishmael Hernandez, before heading out through the bean fields to see how the plants are greening up for a mid-April harvest. While driving to his next stop, Jones was on his cell phone, making calls to set up appointments or check on projects. About 20 minutes later he was at his potato fields near Port Manatee, where more harvesting of potatoes was in progress. It was a quick stop to speak with his harvester driver, then off again to a farm-equipment repair and machine shop in Ruskin, before heading back to his office. On that day Jones put about 40 miles on his truck before noon, but that is typical, as is the busy schedule he keeps. 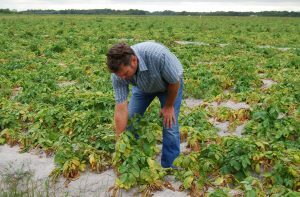 Alan Jones checks on the health of his crop of potatoes in one of his fields in Manatee County. 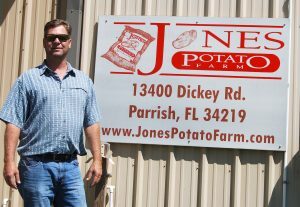 Jones farms about 2,500 acres of potatoes out of a total of about 4,000 acres from Port Manatee to Parrish to Duette. He raises green beans and citrus and has a cattle operation on the other acres. He logs about 40,000 miles a year on his pickup and many hours in his office and in the fields or on the road. “I’ve had very few days off in the past couple of months,” said Jones, who has owned the 4,000-acre plus Jones Potato Farm since 1986. Jones was born to be a farmer, coming from an agricultural family who had potato farms in the St. Augustine area. After studying food resource economics at the University of Florida, where he met his wife Leslie, he came to Manatee County in 1986 to farm. 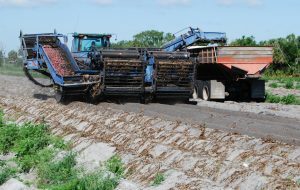 Since potato farmers elsewhere in the United States have to wait until the temperatures warm up or the ground to thaw before planting, Jones felt he had an option for an earlier market for potatoes by farming farther south in Florida in Manatee County. 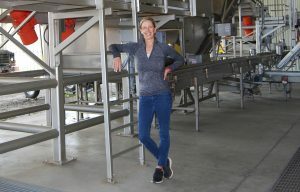 Leslie Jones, food safety coordinator, stands in front of one of the sorting machines at the green bean packinghouse on Buckeye Road. Jones, with her husband Alan, owns Jones Potato Farm in Parrish. “There was one other potato farmer in the area when Jones came in 1987, but Jones Potato Farm is the only one now,” he said. According to Florida Department of Agriculture 2017 statistics, potatoes ranked seventh of the major vegetable and berry crops grown in the state. That year the top seven vegetable crops, plus berries and watermelons, had a total value of $1.616 billion, up $13 million from 2016, according to the statistics on the agriculture department website, and potatoes increased in value eight percent that year over 2016. Cultivating potatoes dates back at least to the Incas, who began cultivating them almost 6,000 years ago. According to the Denver-based Potatoes USA, a potato marketing and research organization, which represents more than 2,500 potato growers and handlers in the U.S., the Spanish Conquistadores took the potato back to Spain in 1536. Sir Walter Raleigh introduced it to Ireland in 1589, and because of its high crop yield and nutritional value, the potato spread across Europe over the next four decades. The Joneses live in Sarasota, where Leslie grew up. “Sarasota has the culture and schools and is near the water,” Leslie Jones said. 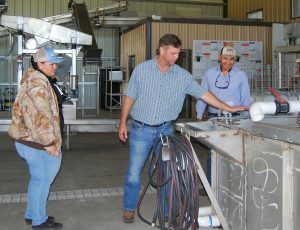 Isabelle Arreola, assistant superintendent, left, Alan Jones, owner of Jones Potatoes, and Ismael Hernandez, farm manager and packinghouse manager, check one of the machines at the packinghouse on Buckeye Road in Manatee County. The couple have been married 27 years and have three children: Madeline, 21, who attends Southern Georgia University and is studying nursing; Harrison, 19, who is studying agricultural economics at Auburn University; and Carson, 17, a junior at Cardinal Mooney High School in Sarasota. Although they live in Sarasota County, the Joneses have been active in the Parrish Civic Association, or PCA, an organization that according to its mission statement, “advocates the interests of the Parrish Community and Preservation of its Heritage.” Alan Jones is the spokesperson for the PCA Rural Development Committee and on the PCA board of directors. She said they also are providing entrepreneurial opportunities for other people with a new office and retail building they built near the Florida Railroad Museum on U.S. 301 in Parrish Village. “There’s a lot of development going on around Parrish, and we don’t want the village to get lost in it,” Leslie said. She said a lot of the company’s employees are from the community and surrounding area. A harvesting machine loads a truck with about 20,000 pounds of potatoes in Jones Potato Farm fields near Port Manatee. “They are dedicated to our company, and we want to help make the community a success,” Alan said. Jones Potato Farm employs 25 people year around and up to 100 during the growing and harvesting season. The table potato varieties grown in most of the fields are red Lasoda and yellow Satina. A potato chip stock also is grown on fields near Duette. Jones likened farming to raising a child: “You try to provide a consistent home life,” he said. “If you have a stable home you’ll have better success. That’s our main job, just as it is in farming,” Alan said. With his son Harrison studying agriculture economics, Alan sees him carrying on the family’s farming tradition. His father David, who passed away one-and-a-half years ago at the age of 86, and mother Jean raised three children on their farm near St. Augustine. Jones’ brother Richard continues to farm in North Florida, and their sister Barbara is in education administration. Washed potatoes travel along a conveyer belt to the sorting and grading machine at Jones Potato Farms packinghouse on Dickey Road in Parrish. He also said you need to be aware of what can happen in the future. 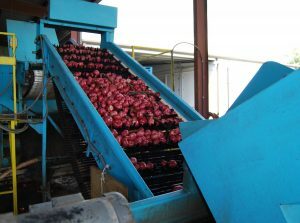 For more information on Jones Potato Farms, visit their website at www.jonespotatofarms.com. On the home page of the site there is a link to a Florida Department of Agriculture and Consumer Services produced video highlighting Jones Potato Farm’s winning the 2016 Ag Environmental Leadership Award for its technical and environmental innovations. You can also follow the business’ Facebook and Instagram pages @jonespotatofarm.